Six days after they started flowering the bunches of tiny flowers have turned into bunches of tiny green grapes. This is a photo of Grenache grapes in one of our Côtes du Rhône vineyards this morning. The weather has been hot the last ten days, but yesterday afternoon and evening was very stormy with thunder and lightning all around, though we didn’t get any rain. 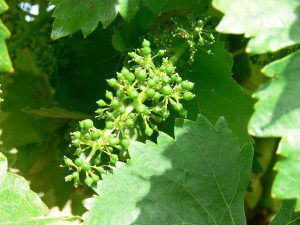 Hopefully the storms will hold off just a few more days yet so that all the vines can finish flowering in good weather. Then the vines would like a storm or two as there hasn’t now been any significant rain for the last five weeks.